The Still Map Image API creates a map based on URL parameters sent through a standard HTTP request and returns the map as an image which you can display on your application. 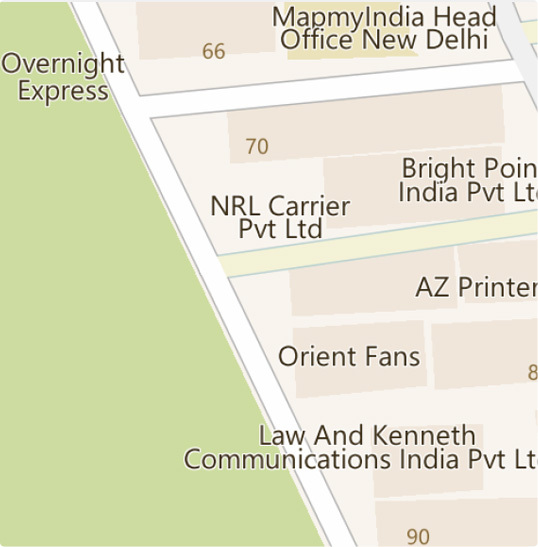 The API lets you embed MapmyIndia Maps image according to geo-position, pixel size and zoom level of the map on your application without requiring any dynamic page loading. The image can be a retina image and markers can be added to the image to indicate position of any object. Output: format will be an 8-bit “.png” image, depending on the input parameters specified. Note: All Mandatory parameters are marked with a “ * ”. *licence_key: the REST API licence key allocated to you by signing into our services and registering yourself as a developer (28 Char Alphanumeric). *centre: a WGS-84 position coordinate that specifies the centre of the image requested. zoom: The zoom level for which the image is requested. Ranges from 4 to 18 with 18 being the highest zoomed in level. size: the size of the image requested in pixels as <Width>x<Height>. ssf: scale factor indicating retina or non-retina tiles. markers: optional markers that you may want to add to the map tile. Performance is dependent on WAN/LAN/WLAN speed. One Request (which returns one image) using the API link will be considered as one transaction. To show a quick location point without having to additionally add a Map Control. To show multiple locations on map without the need to add a Map Control. If the request was passed as src attribute of Image, browser would have shown the image.